Will Obama's Stimulus Package Work? Surely this wasn't what Barack Obama had in mind when he imagined the days leading up to his historic Inauguration. On Tuesday, the President-elect journeyed to Capitol Hill to try to avoid the possibility that his first act in office will be vetoing a bill passed by both houses of Congress. The President-elect, however, can be a very persuasive politician, and McCaskill emerged from the luncheon singing a different tune. "He made a pretty compelling case," she said. McCaskill still wasn't quite ready to promise her vote, but others apparently were. Enough Democrats left Tuesday's meeting ready to support Obama that Senate majority leader Harry Reid afterward told reporters, "I think we will get the necessary votes" to block the resolution in a vote expected on Thursday. It was a sharp change from earlier in the morning, when his office had expressed doubts that they had the votes, even though Dems, who hold 58 seats right now, only need to produce a simple majority of 50. "We can all look back and talk about how the first $350 billion was not spent, but it's very clear that there's going to be a lot of money spent to help the housing industry," said Reid. Even before he appeared on the Hill, Obama was laying groundwork to avoid a TARP train wreck. In a letter sent on Monday to congressional leaders, he pledged to devote much of the second installment to assisting small businesses and helping students and car buyers get loans. In personal calls to members on both sides of the aisle he promised better transparency of how the funds are disbursed, reflecting the frustration and anger of many members regarding the Treasury Department's handling of the funds. Still, many Democrats said on Monday that Obama's letter was not enough to convince them to vote against the resolution, which was filed by Senator David Vitter, a Louisiana Republican. Most fiscal conservatives, like Vitter, opposed the TARP from its inception, and even those who voted to pass it in September have insisted that something more than Obama's vague promises is needed to win their grudging support. So what did Obama say to charm his former colleagues into blocking the resolution? He promised to write, in a detailed manner, a letter explaining how his Administration would dole out the funds once he is sworn in on Jan. 20. "The conditions have to do with tracking the money, how the money can and can't be used, accountability for the money, what dividends cannot be spent with it, the executive pay issues," said Senator Carl Levin, a Michigan Democrat, emerging from the meeting. "In other words, there's a whole host of misuses of the first half which have to be avoided the second time around." The detailed letter, which may come from Obama's economic adviser Larry Summers, is expected to arrive before a potential vote on Thursday. Levin added that such a letter would be enough for him to vote against the resolution. Still, some Democrats said they would like to see more than a letter from Obama. "My preference would be for a legislative solution," said Ben Nelson, a Nebraska Democrat. Such a solution, though, is unlikely, as it would open up a complicated can of worms on how to dictate terms to the new President, Republican and Democratic sources said. On the other side of the aisle, many Republicans who voted for the first tranche of the TARP were leery about this second vote, because at least $23.4 billion of the initial outlay has been used, over their objections, to bail out the auto industry. Summers, in a separate letter earlier this week, pledged that any additional funds for the automakers would not come from the TARP monies. "There are some folks [on] our side who are open to being against this resolution, and if they can negotiate some language that would be acceptable, I think you can get some votes," said Senator John Thune, a South Dakota Republican. At least one Republican, New Hampshire Senator Judd Gregg, has said that he is inclined to vote against the resolution. If the Senate were to pass the resolution, it would almost certainly pass the House  where leading Democrats like Barney Frank are pushing for stringent, spelled-out conditions  and then go to the President's desk for a veto, Democratic sources said. Even if Bush can do the honors before he leaves office, Obama would still have to take office as both chambers attempt overrides of the veto. Such a situation might force Obama to expend some of his political capital on fixing the holdover problem, and it could drain support for what he prefers to be concentrating his time and energy on: a potentially trillion-dollar stimulus bill. That too, of course, is essentially another bailout, but it's directed at Main Street, so the President-elect can count on a little more gratitude from the American public. If he can't spend his entire inaugural week celebrating, that's the least he can expect in return for his efforts. 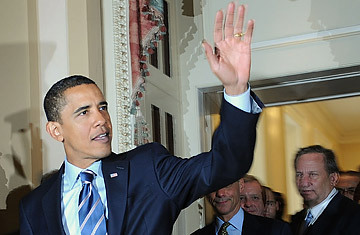 See pictures of Obama on Flickr.